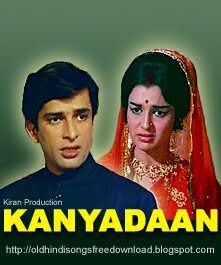 Free Download Kanyadaan Songs 1969: Kanyadaan was released in the year 1969, with star cast Shashi Kapoor, Asha Parekh, Om Prakash, Achala Sachdeva and Tun Tun. The movie was directed by Mohan Segal, and music was composed by Shankar Jaikishan & Dayabhai Pankal. The film was not able to rule the box office, but the music is uniformly amazing, with two of the songs – “Likhe Jo Khat Tujhe”, sung by Mohd. Rafi and “Mil Gaye Mil Gaye Aaj Mere Sanam” sung by Lata Mangeshkar, reaching states of such inspirational bliss that our love of Hindi Film was reaffirmed big time. Free Download Kanyadaan 1969 Songs. 04 – Meri Zindagi Mein Aate – Mohd. Rafi. Free Download Knayadaan 1969 Songs .rar file.